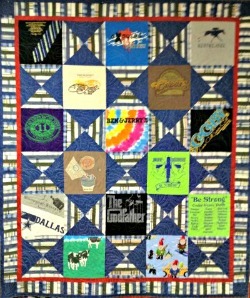 In an age where t-shirt quilts are in demand for old and young alike what better way to preserve a legacy? 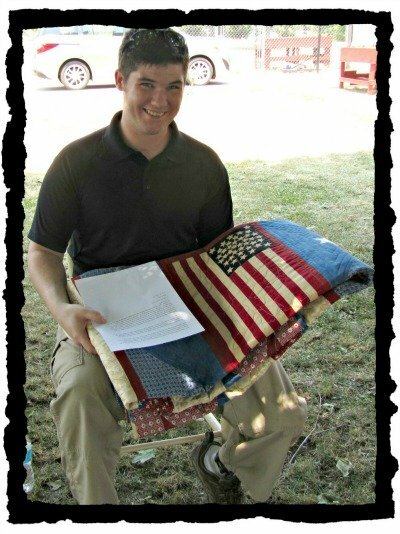 ...but on a bed, snuggle with it in your favorite chair or use it as a wall hanging. 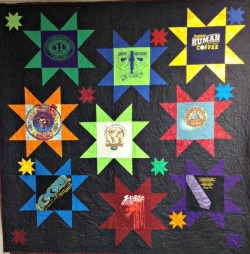 These quilts have been tagged as Crazy Quilt Patterns to do just that. Of all the quilts that I have made, the t-shirt quilts are my favorite...but then I'm a bit of a nostalgic person and I like Easy Quilt Patterns! How Did Jeffrey Trussell Earn His Wings? 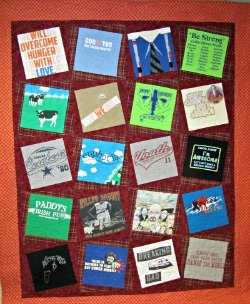 I was invited to make a t-shirt quilt using Jeffery's many t-shirts. 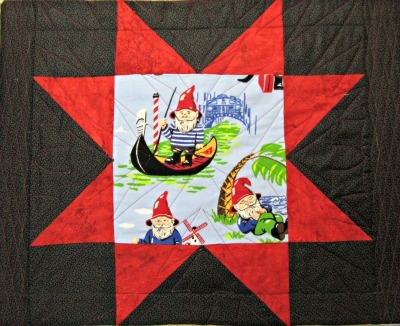 It was my first with the help of a pattern designed by Judy Bobbitt found in her book "You Did What?? With My T-shirts!" Someone shouted, "Hold on", as the voice reverberated throughout the bus. Deacon Jeff's van felt the head-on impact with the SUV that crossed the center line traveling at a high rate of speed..
Deacon Jeff and twelve other teenagers were returning home from what was otherwise a perfect ending for a trip to Gatlinburg. Deacon Jeff was a volunteer leader for the Cedar Grove Baptist Church Youth Group. This particular trip for the teenagers was a reward for serving at Second Harvest Food Bank that serves all of East Tennessee. At Second Harvest the volunteers distribute food through churches, shelters, group homes, soup kitchens, community centers, and schools in the East Tennessee area. As the church van with Deacon Jeff at the wheel and the twelve volunteers as passengers were returning home, they found themselves struggling to escape the fiery inferno. All but two, Deacon Jeff and Courteney a sixteen year old student at Seymour High School, escaped minor to severe injuries. God always has a reason for his choice when selecting angles. Jeff and Courteney have earned their wings! We all, as caring and loving human beings, need to share with those that are in need. When Kim Trussell set up the memorial to honor the volunteers she explained “It is my intention by establishing this memorial fund in loving memory of Jeff and Courteney that we will not only shed a light on the blessings they both were, but that we will shed light on a way more people can be a blessing themselves by supporting Second Harvest Food Bank with their financial gifts, no matter how great or small, and perhaps even with their time as a volunteer. Only $1 provides 3 meals; $10 feeds 30; $100 feeds 300. The young man that made many wrong decisions was charged with causing the deaths of two church members and injuries to several more when the vehicle he was driving collided with the church van on Chapman Highway near Knoxville Tennessee. He allegedly was high on bath salts when his vehicle crossed the center line and slammed into the van which exploded into a ball of fire. Stabilize t-shirts with fusible tricot interfacing; however stay away from fusible non-woven interfacing as it will not stretch with the t-shirt and in time come loose from the t-shirt back. T-shirts stretch from side to side. The tricot fusible has a stretch also. If you place the fusible in a position so that the stretch is from top to bottom, this will stabilize the t-shirt stretch from side to side. 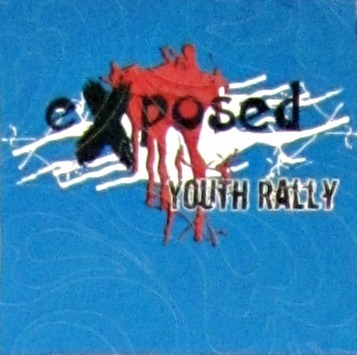 Use a pressing sheet between the t-shirts and iron… wax paper will work if you do not have a pressing sheet. Cut the logo part of the t-shirt at least an inch larger than needed size. 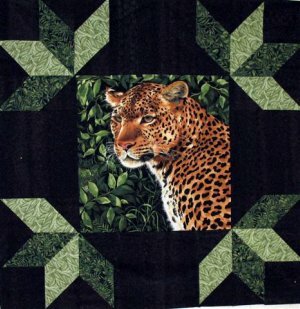 EXP: if using 12-inch blocks in your quilt, cut the t-shirt design 14x14, press fusible tricot interfacing on back of this, then trim to 12-1/2 x 12-1/2 with a square ruler. 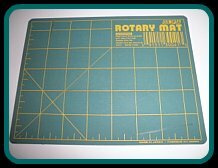 If you do not have an acrylic square in the right size, make one out of template plastic, mark around it and then cut your pieces. 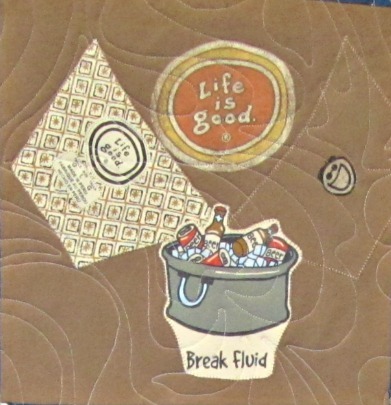 If you have several small designs you can applique these on blocks that are less than full. See the 3rd image below. The 3 cutouts are appliqued on a white t-shirt. 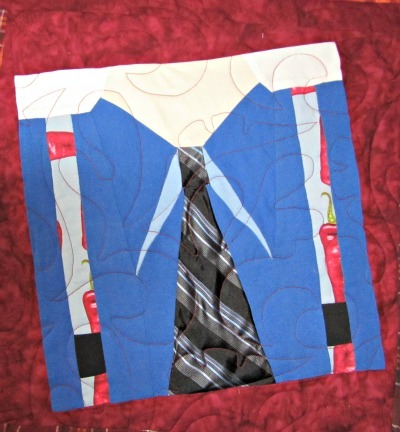 Likewise in the first image below is pieces cut from t-shirts, a tie and pajamas for suspenders to create this block. 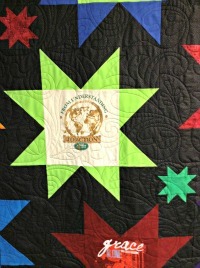 You can also use other t-shirt fabrics to finish blocks as I did in the “oh my stars” quilt. 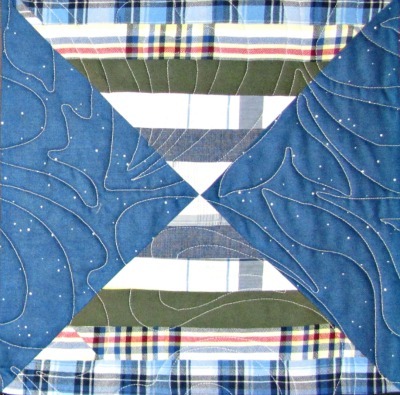 The flying geese are cut from t-shirt fabric and sewn to a t-shirt block. If you place the fusible facing toward the feed dogs, the pieces will feed more evenly. 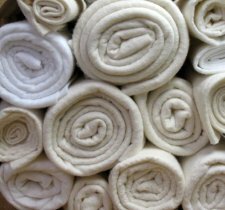 If you have extra shirts, you might consider using these as a back for your quilt. 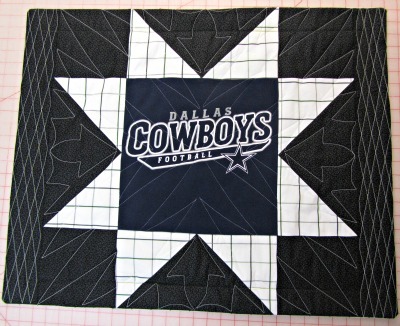 Stabilize and add sashing pieces to make the backing large enough. You can make pillow shams with left over t-shirt logos also. I will show you how later. T-shirt quilts are relatively heavy so I recommend that they be machine quilted. Don’t be afraid to cut part of the t-shirt logo. The essence of the logo will still be intact if the complete wording is not used. 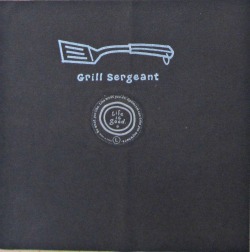 Cut small writing or pictures from the shirt and place them on the chosen block. 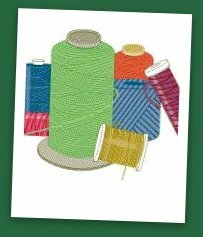 You do not need a seam allowance as you just sew around the raw edge with a zigzag or straight stitch. You can even fringe the edge of the cut out piece as the knit fabric does not fray. 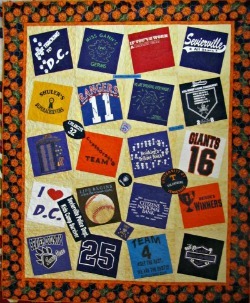 You can add pictures that have been transferred to fabric, numbers or letters taken from game jerseys and other elements to enhance your quilt. 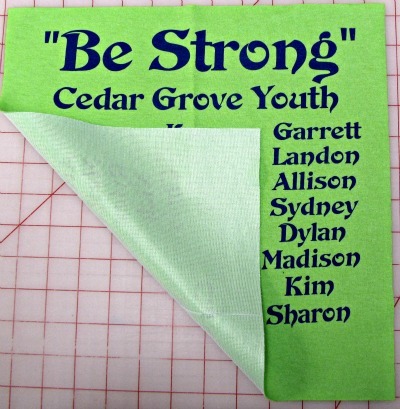 These t-shirt quilts were made by sewing a sashing to each 12-1/2inch block by using two contrasting colors cut on a diagonal lengthwise…Sashings are cut with right sides facing up. 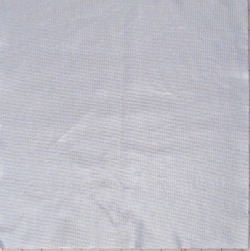 (this is a must) Cut at a diagonal from top left to bottom right corner fabric #1. 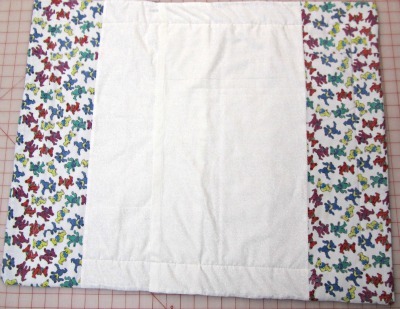 Match the right angle of a lopsided frame strip to a corner of the t-shirt quilt with right sides facing. Sew 3/4 of the way down, leaving the remaining seam line open (diagram C). 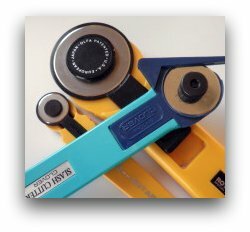 Rotate one quarter and attach a second lopsided frame strip, this time sewing the entire seam line (Diagram D). Continue this for remaining two lopsided frame strips (Diagram E). Last finish the seam from the first frame. Press and trim. Repeat this process for 10 blocks using fabric #1 and 10 blocks using fabric #2. Using your display board, arrange your blocks alternating frame fabrics in a grid of 4 blocks x 5 blocks. Sew the blocks into rows and then rows together. These t-shirt quilts really are easy quilts to make. 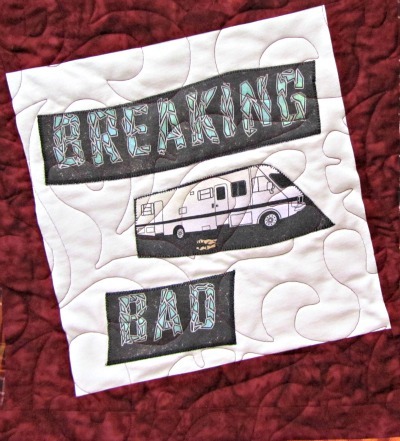 This quilt takes a little more thought and time to complete. 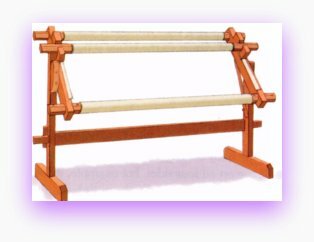 You will need to cut strips of material from your cotton shirts and then sew the strips together. HINT: to keep your strips nice and straight try sewing the strips in opposite direction…exp: sew strip 1-2 from top to bottom, add strip 3 & sew from bottom to top…continue in this order and your strips will not be wavy. Cut 4 inch sections (or however wide you want your border to be) from pieced strips for borders sewing end to end; cut triangles from the pieced strips for pieced blocks. Sew striped triangles to solid triangles. 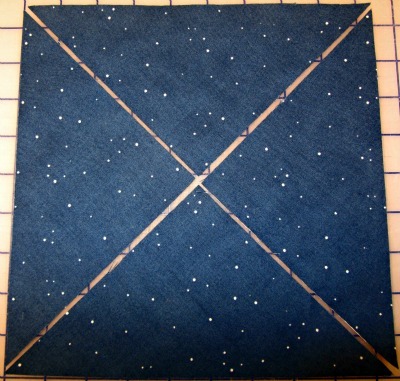 First build flying geese units by joining 2 star fabric triangles to a background triangle. Arrange flying geese units between two corner squares for one row (make 2 rows). Arrange flying geese units to the sides of a t-shirt block. 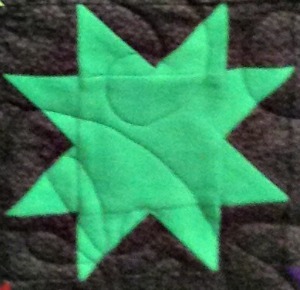 Sew rows to form one star block. 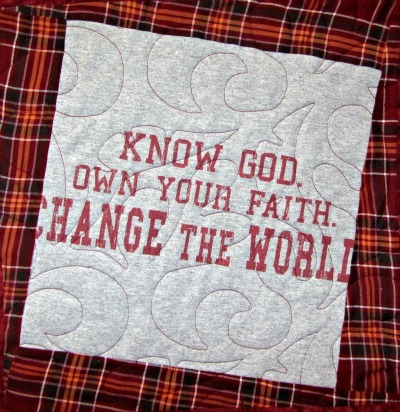 Be creative and make matching pillow shams using left over t-shirt logos and material. 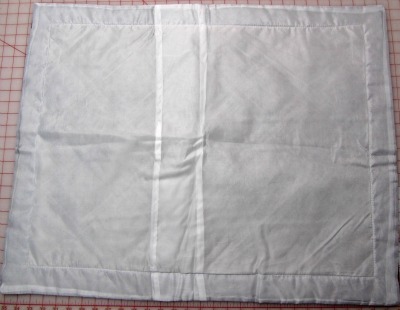 These pillow shams measure 28 inches wide x 23 inches long and fits a standard size pillow. Cut one piece of material from the back of a dress shirt 17 x 24. Hem one end (24inch) by folding over 1/2 inch and folding over 1/2 inch again. Top stitch. Sew to top of sham with right sides together around three sides leaving the hemmed edge open. Cut another piece of material from the back of a dress shirt 18 x 24. Hem one end (24inch end) by folding over 1/2 inch and folding over 1/2 inch again. Top stitch. Sew to top of sham with right sides together overlapping the first piece already sewn with the hemmed edges overlapping. Sew around three sides leaving the hemmed edge open. Trim seams. Turn the sham right side out making corners square. Stuff with a standard size pillow.